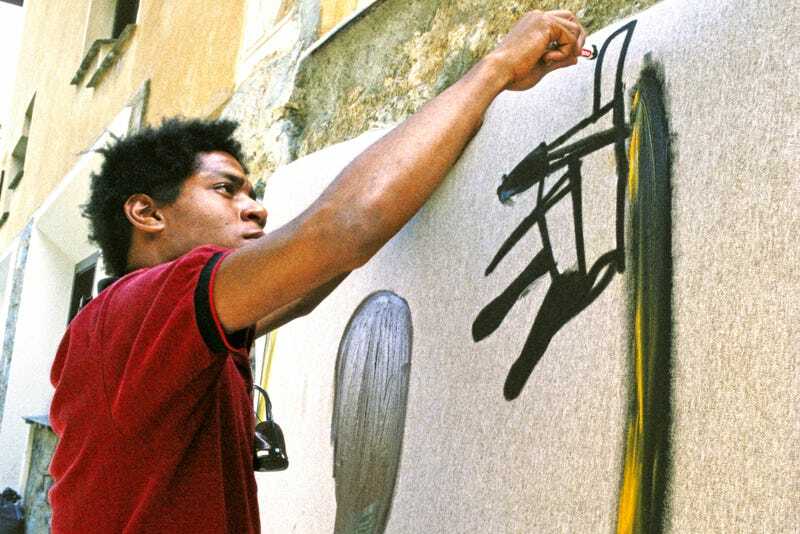 Artist Jean-Michel Basquiat paints in 1983 in St. Moritz, Switzerland. For the 20th anniversary of his Sean Jean clothing brand, Sean “Puffy” Combs’ latest artist collaboration is a partly posthumous one: a five-piece T-shirt-and-denim capsule collection featuring the work of painter Jean-Michel Basquiat. Basquiat, who died in 1988 at the age of 27, illustrated what it meant to be a successful artist for his generation. Blessed with great talent, the artist lived out a strangely fairy-tale existence. Born a middle-class kid in Brooklyn, N.Y., he went from a loving home to living in a cardboard box in New York City’s West Village, where he made his way to becoming an art-world darling in the roaring market of the 1980s, quickly recognized and handsomely rewarded by collectors, institutions and artists alike for his graffiti-inspired art dealing with themes of black identity and personal obsessions. Basquiat’s works have sold for record-shattering prices, most recently in May 2017, when his work Untitled was bought at Christie’s auction house by the richest man in Japan, billionaire Yusaku Maezawa, for a reported $110.5 million. To date, it is the highest price ever paid for a work by an American artist, a record previously held by Silver Car Crash (Double Disaster), by Basquiat’s mentor, pop art icon artist Andy Warhol, which sold for $105.4 million in 2013. But not all fairy tales have happy endings. Basquiat’s golden-boy status and meteoric rise were chronicled in the 1996 film Basquiat, made by his friend, painter and Oscar-nominated director Julian Schnabel. It was the Hollywood version of how Basquiat magically lit up the art world, only to sadly flame out in ruins from a heroin overdose. During his short life, Basquiat ran in the rock-star world of painters, with Warhol as his champion and mentor. Warhol reportedly never took a drink or drug—and begged Basquiat to get clean, to no avail. The two even collaborated on paintings; Basquiat—who went by the graffiti tag “SAMO”—painted on top of Warhol’s work. It was a version of sampling, marrying one side of pop culture to another. Basquiat is admired as much for his in-your-face art, exploring ongoing themes of skeletons (symbolizing death); crowns (symbols of money, power and respect); and paint dripping and oozing like blood (a visual metaphor for passion and struggle), shot through with text from hip-hop music, where black men’s real and raw speaking voices were being heard for the first time in pop culture. Like a true graffiti artist, Basquiat painted on canvases, plates, doors, notebook paper, even his girlfriend’s dress, you name it—he painted on whatever was at hand when inspiration seized him. Basquiat rose to the top of the art-world game crowned with natty dreads, open to using questions of his black identity as a way to call into question perceptions of race. He often called his art “ignorant art” as an attention-grabbing marketing tactic, then turned around and fought the moniker of being called a “black painter” as a qualifier. Luckily for us, we’ve arrived at an era where important black painters are becoming the norm. Kehinde Wiley and Amy Sherald’s portraits of Barack and Michelle Obama, respectively, hang in the National Gallery, and more are sure to come. There’s also a long list of important black artists who paved the way for us to go and buy a Sean John x Basquiat T-shirt at Macy’s, on sale this week. In the collection, the jean jacket, adorned with a marauding T. rex with Basquiat’s iconic gold crown floating above its head like a halo, is particularly poignant. The image is probably most famous from the children’s book Life Doesn’t Frighten Me, published five years after Basquiat’s death in collaboration with poet laureate Maya Angelou. It’s a pleasure to see art and commerce come together to both educate and enrich a new generation.